A University of Minnesota research team took another look at the consequences of raising pigs without tail docking under modern, confinement housing system conditions. A pig being bitten over and over feels pain. The standard operating procedure of tail docking, performed to prevent the common historical problem of tail biting, is also criticized for inflicting pain. The issue to dock or not dock the tail has been under scrutiny. Since tail biting may not occur to all pigs, it is fair to ask the question if it is necessary to dock every pig’s tail to prevent tail biting. Past research shows that once tail biting begins, it will continue and may intensify due to the attraction of pigs to the smell and taste of blood. Obviously, experiencing constant pain can negatively impact animal welfare and overall pig performance. Therefore, to minimize the risk of tail biting, hog farmers routinely dock tails. While pain is associated with tail docking, it can be minimized when the procedure is performed as early as possible in a pig’s life and with an appropriate analgesia. Yet, it still receives criticism from non-agriculture groups. A University of Minnesota research team took another look at the consequences of raising pigs without tail docking under modern, confinement housing system conditions. The study was conducted to compare welfare, behavior and performance of pigs with and without tail docking. A group of 352 pigs farrowed within a week was used for the study. At farrowing, in each litter half of the pigs’ tails were docked within the first 24 hours of birth and the remaining pigs’ tails were left intact. All piglets were weaned at 4 weeks of age. Once weaned, all pigs — weighing an average of 17.2 pounds — were housed in a confinement nursery barn with eight pigs per pen for five weeks. During the nursery period, there were 20 pens of docked pigs and 24 pens of undocked pigs. At 9 weeks of age, due to space limitations, and the intent to track data in the grow-finish unit separate from the nursery, 240 pigs (initial average weight of 54.8 pounds) without any tail damage were moved to a confinement finishing barn and housed in eight pens of 30 pigs for 16 weeks (average final weight of 277.5 pounds). There were four pens of docked and four pens of undocked pigs, each consisting of 15 barrows and 15 gilts during the grow-finish period. Weight gain and feed intake were recorded throughout the study. Every four weeks and during outbreaks of tail biting, all pigs were assessed for tail damage. For this experiment, an outbreak is defined as blood showing on the tail of one or more pigs. Tail lesion severity was assessed on a scale of zero (no damage) to 4 (partial or total loss of the tail). Pigs with a score of 3 or 4 were removed from their home pen and placed in a hospital pen. Carcass weights and incidence of carcass trim loss were recorded. Overall, undocked pigs experienced more tail damage. As shown in the table, during the nursery phase tail lesions were visible on 41% of undocked pigs compared to only 2% of docked pigs. Similarly, 89% of the undocked pigs in the grow-finish periods suffered lesions from tail biting. The first outbreak of tail biting began at 11 weeks of age, which occurred six weeks earlier compared to docked pigs. 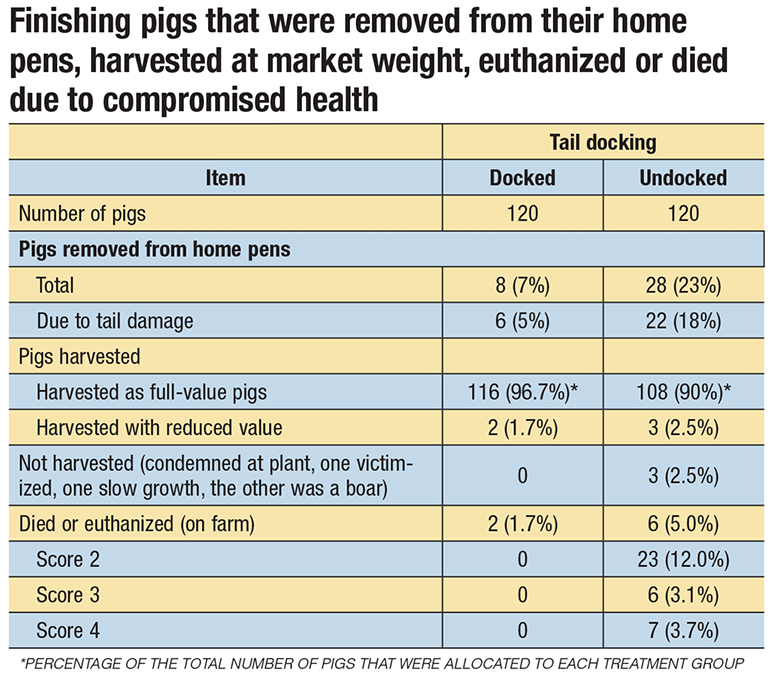 Furthermore, 18% of undocked pigs as opposed to 5% of docked pigs were removed from the grow-finish unit due to tail damage. For pigs that were not removed, feed intake was not different between pens with docked pigs and pens with undocked pigs. Weight gain was similar in both treatment and control pens. However, as a consequence of carcass trim loss, carcass contamination and mortality, 90% of undocked pigs, in contrast with 97% of docked pigs, were harvested for full value. Results of this study indicate that raising pigs without tail docking in a confinement housing system increases the incidence of tail biting and tail damage, resulting in higher morbidity, reduced value and compromised welfare of pigs. Also, costs of production could rise for farms that choose not to dock the tails of the pigs, because an increasing amount of time is needed to monitor the injuries and increase the amount of hospital space. In conclusion, the scientists reaffirm the short-term pain of tail docking seems worthwhile to protect pigs from suffering tail damage later in the grow-finish phase. Researchers: Yuzhi Li and Lee Johnston, West Central Research and Outreach Center, University of Minnesota, Morris, and Wayne Martin, University of Minnesota Extension, St. Paul. For more information, contact Yuzhi Li at 320-589-1711 or yuzhili@morris.umn.edu. Does mixing pigs influence farm throughput?